Now you can pay your membership online! 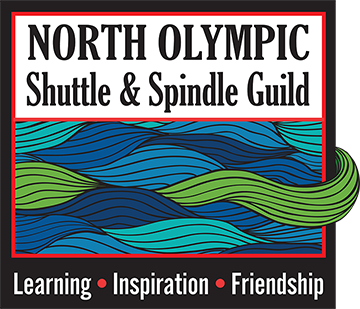 The North Olympic Shuttle and Spindle Guild share learning and fellowship of the Fiber Arts through “show-and-tell” at monthly meetings, study groups, workshops, programs, field trips and educational demonstrations and exhibits in the community. The group meets monthly, the current contact people can provide you with the time and place for the next meeting place and activity. Meetings provide an opportunity for sharing and showing members’ accomplishments as well as programs by members or outside experts. We also have monthly spin-ins, do field trips and have study groups on a variety of topics, including weaving, complex weaving, natural dyes and small looms. These are chosen by the group based on current interest and change over time. We have a program committee that organizes the monthly programs and workshops done by fiber arts experts. Past workshops have included painted silk scarves, weaving of Scotland in song and story, overshot weaves, silk spinning, cotton spinning and more. 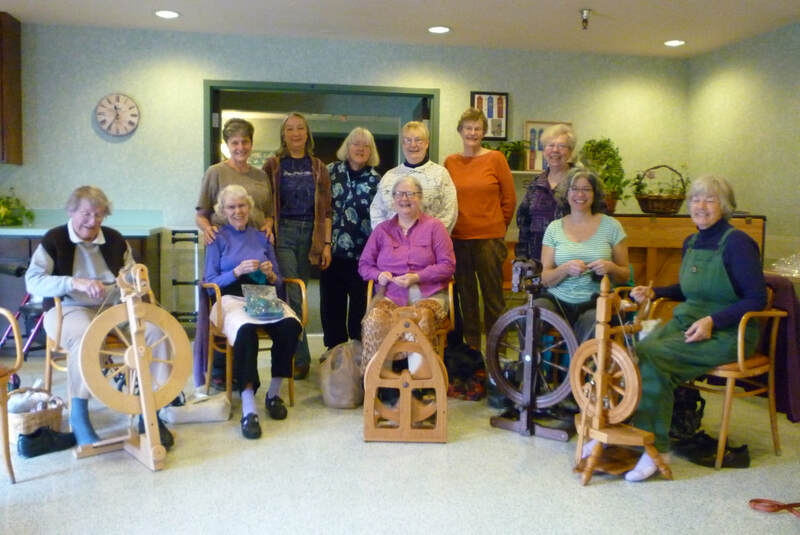 Workshops and fashion shows are done in conjunction with the local knitting group, other local chapters of the Handweavers Guild of America (HGA), and local Northwest Regional Spinner’s Association (NWRSA) groups. NOSSG is a member of the Association of Northwest Weavers guilds (ANWG and HGA). HGA sponsors Convergence, a bi-annual conference of weaving and spinning. We also keep in touch with nearby guilds, sharing newsletters and workshops. Members include fiber artists, sheep, llama and other fiber animal owners, beginners to advanced and the curious at heart. There is a strong spirit of mentoring, camaraderie and support within the guild. Monthly meetings with a program that includes a fiber arts presentation or lesson with discussion at the Sequim Community Church the first Saturday of the month. An extensive guild library of books and magazines on spinning, weaving, knitting and other fiber arts and also equipment including a drum carder, weaving loom and a great wheel. A monthly newsletter with news from each meeting, announcements of workshops and spin-ins, members tips and more. We sponsor an award winning booth at the Clallam County fair, with demos and educational material. Participation in the local Shepherd’s Festival, spinning and weaving demos, and sale of our fiber arts on Memorial Day. Active participation in the North Olympic Fiber Arts Festival the first weekend of October with hands-on instruction, demonstrations, exhibition and sale. Workshops from well known artists, study groups lead by our own members, and local and statewide field trips.